Nineteen species of bats have been recorded in Canada, and 17 of them are regular residents. In many ways, bats are typical mammals: they are warm-blooded, give birth to live young and suckle them. Their ability to fly sets them apart from all other mammals. Their wings are folds of skin supported by elongated finger, hand, and arm bones. Wing membranes attach to the sides of the body and the hind legs. In Canadian species, the tail is enclosed in the membranes. Resting bats usually hang head downward so that taking flight means just letting go. 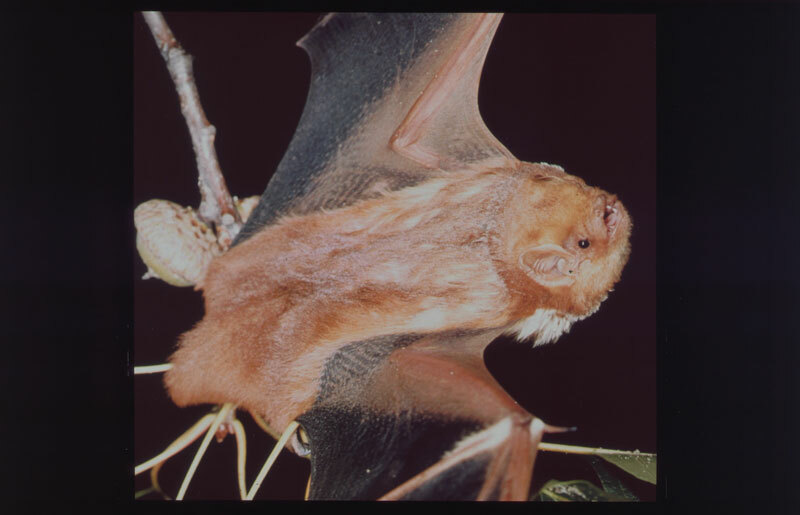 With their wings spread, flying bats appear larger than resting ones. But bats are small mammals. 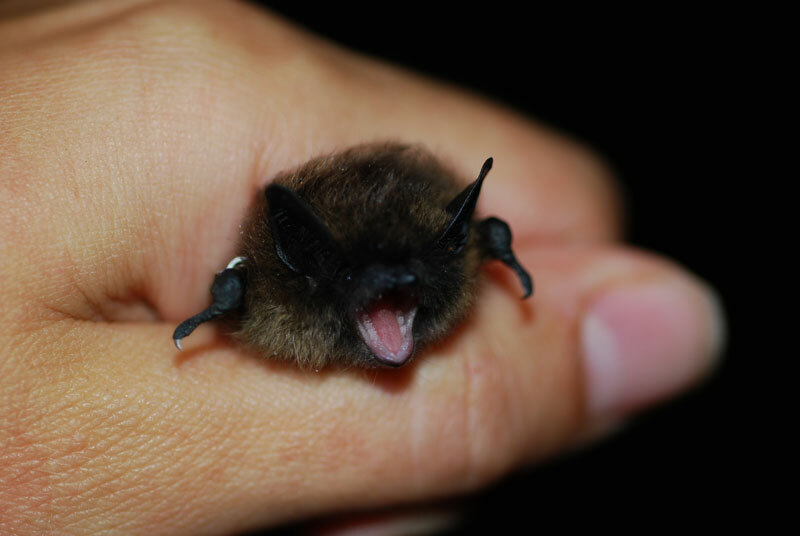 For example, an average-sized Canadian bat, the little brown bat Myotis lucifugus, weighs about 8 g in summer (the mass of two nickels and a dime) and has a wingspan of about 22 cm. 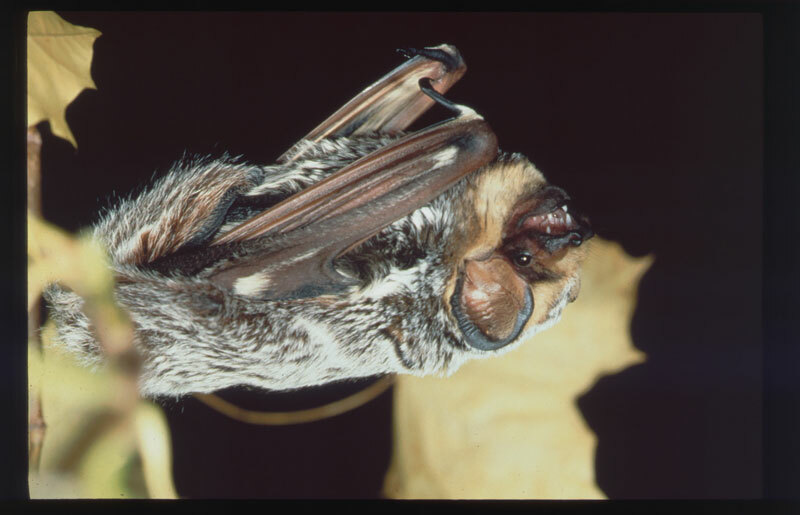 The hoary bat Lasiurus cinereus is the largest Canadian species, weighing about 30 g, with a wing span of 40 cm. At about 5 g, the smallest Canadian species are the eastern and western small-footed bats (Myotis leibii and Myotis ciliolabrum, respectively). 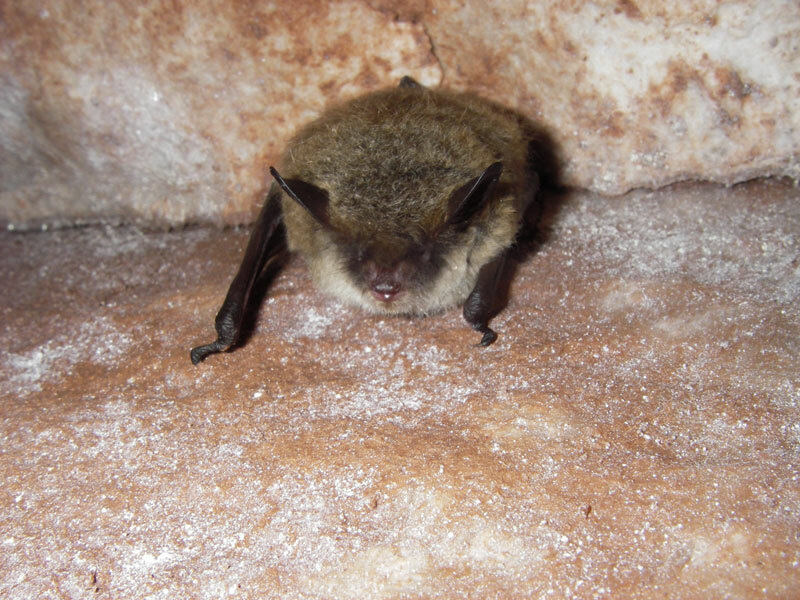 Bats are long-lived mammals, the current record for being a banded little brown bat from a mine in eastern Ontario that survived more than 35 year. Bats are well known for their echolocation behaviour. Most bats — and all Canadian species — use echoes of the sounds they produce to locate objects in their path. Higher frequency sounds have shorter wavelengths and give bats more detailed information about their targets. 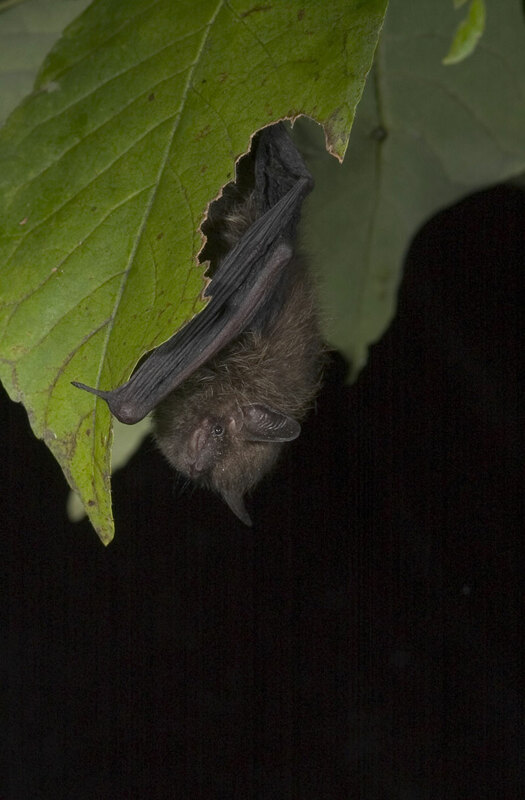 Most Canadian bat species use echolocation calls that are ultrasonic (beyond the range of human hearing). A notable exception is the spotted bat Euderma maculatum, which occurs in the Okanagan Valley of British Columbia and uses lower-frequency echolocation calls readily audible to most people. Bats are primarily nocturnal creatures, sleeping during the day and hunting and feeding at night. Bats are not blind. The eyes of many bats that eat insects are inconspicuous, but bats see very well and use vision for many of the things they do. However, as far as we know, Canadian species use echolocation to locate their prey, and their large ears reflect the importance of sounds in their lives. 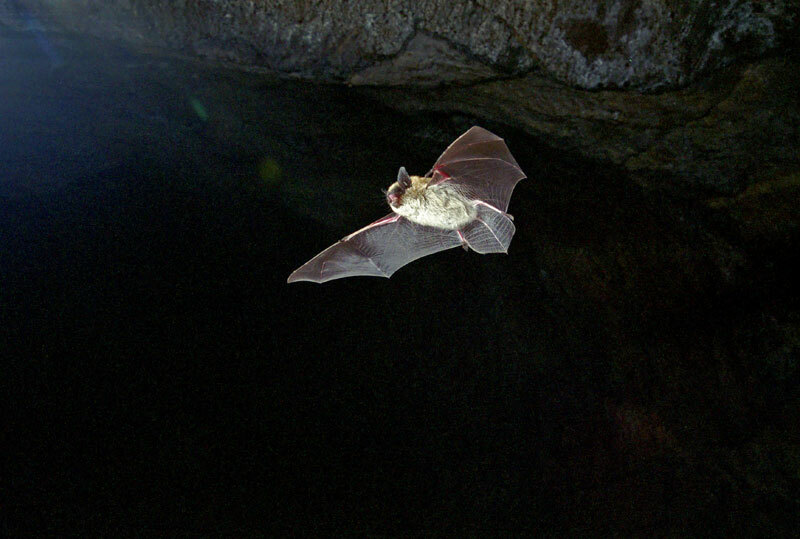 In echolocation, the difference between the original sound and its echo contains the information used by the bat to locate and identify objects in its path. Echolocation is not a characteristic of all bats, and it also is used by toothed whales, some cave-dwelling birds, and mammals such as shrews. 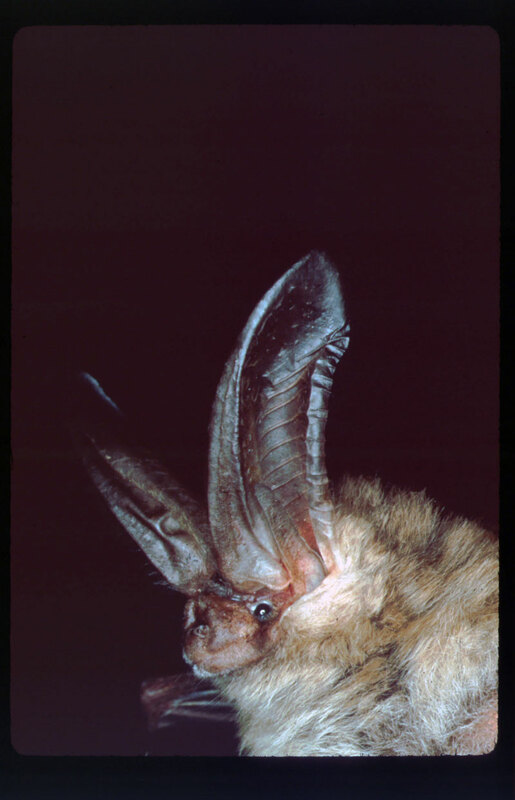 The ears of many insects, including many species of moths, lacewings, crickets, mantids, and beetles, are sensitive to the echolocation calls of bats. This sensitivity allows these insects to avoid capture by flying away or taking evasive action (as shown in the illustration). The spotted bat is an interesting exception. Most insects cannot detect its lower-frequency echolocation calls, making these bats much more difficult to detect and evade. In the summer some bat species gather in colonies, while others live alone. 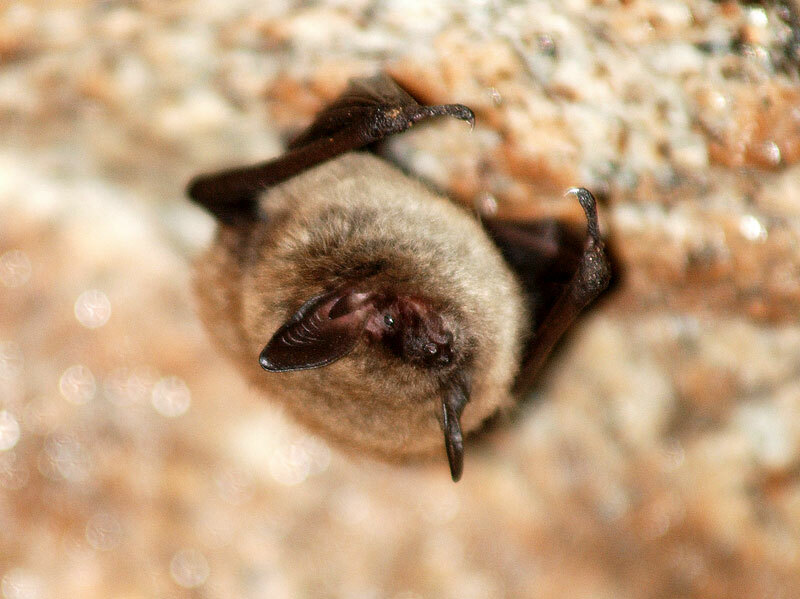 The former include species that roost in buildings, such as the little brown bat, big brown bat Eptesicus fuscus, and Yuma bat Myotis yumanensis. 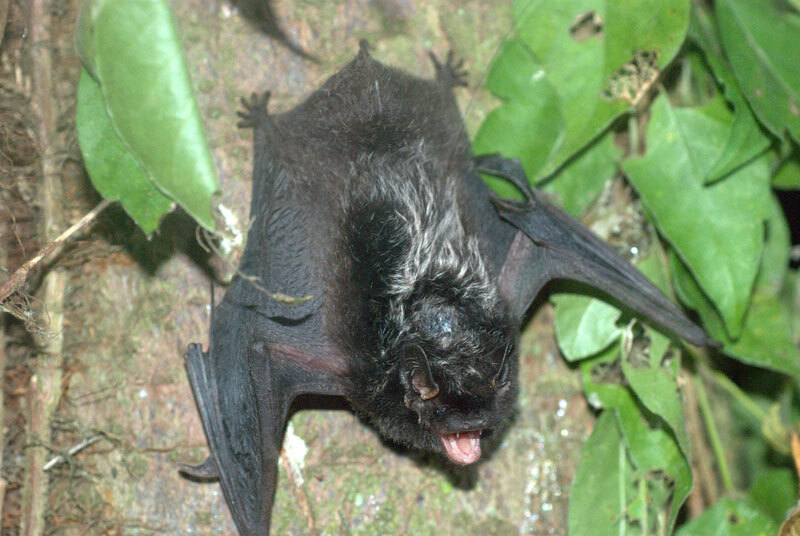 The latter include foliage species (species that roost in trees or vines), such as red bats Lasiurus borealis, and hoary bats. 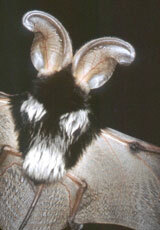 Other species, such as the pallid bat Antrozous pallidus and the spotted bat, roost in cracks and crevices in cliffs. In the fall in Canada, when weather conditions become harsher and the insect food supply disappears, bats resort to some combination of migration and hibernation. 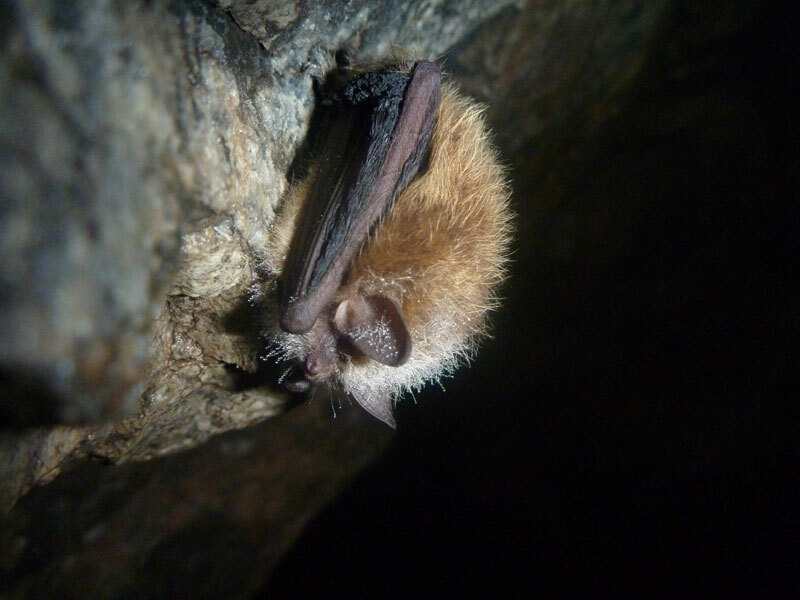 Some common species that roost in buildings, including little brown bats and big brown bats, make long or short migrations to hibernation sites — little brown bats travel up to hundreds of kilometres; big brown bats migrate up to tens of kilometres. 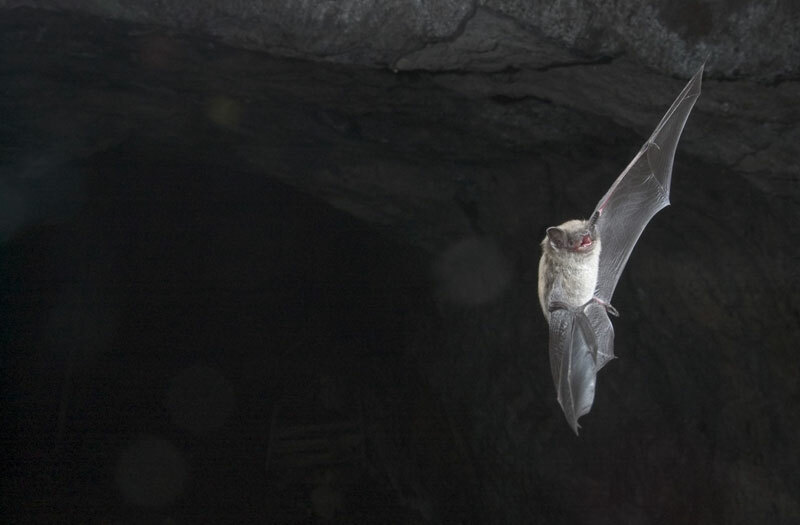 Bats usually hibernate underground, often in caves or abandoned mines, where the temperatures are stable and above freezing and the humidity is very high. 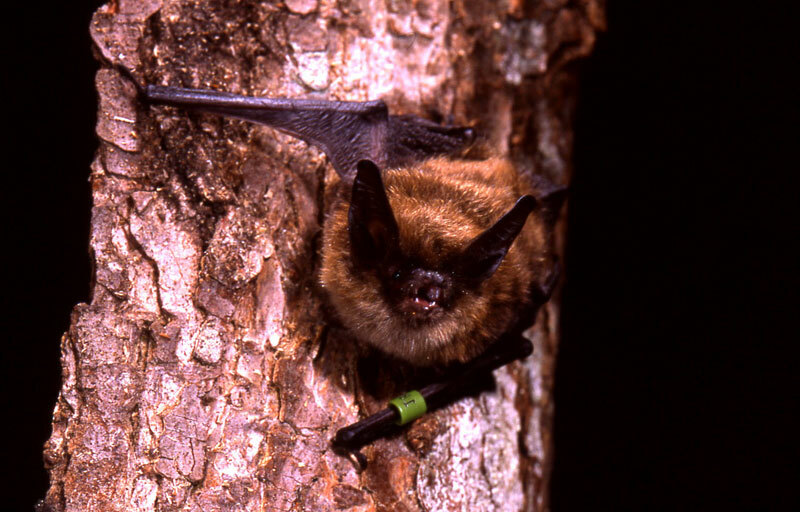 Other species, such as red bats, hoary bats, and silver-haired bats Lasionycteris noctivagans, migrate to more southern locations, where they may hibernate in hollow trees or leaf litter (red bats) or they may remain active. Like all other mammals, bats are susceptible to rabies, a viral disease that causes progressive paralysis and death. The rabies virus often is found in saliva and can be transmitted by the bites of infected animals. The incidence of rabies in bats in Canada seems to be low, but we lack details about the general incidence of the disease in the bat population. Some species are more often found rabid than others, and there is geographic variation in the incidence of rabid bats. Nobody should ignore a bite from a bat. Anyone who has been bitten by a bat or other mammal should contact a physician and Agriculture and Agri-Food Canada personnel, who can arrange to have the animal that delivered the bite tested for rabies. 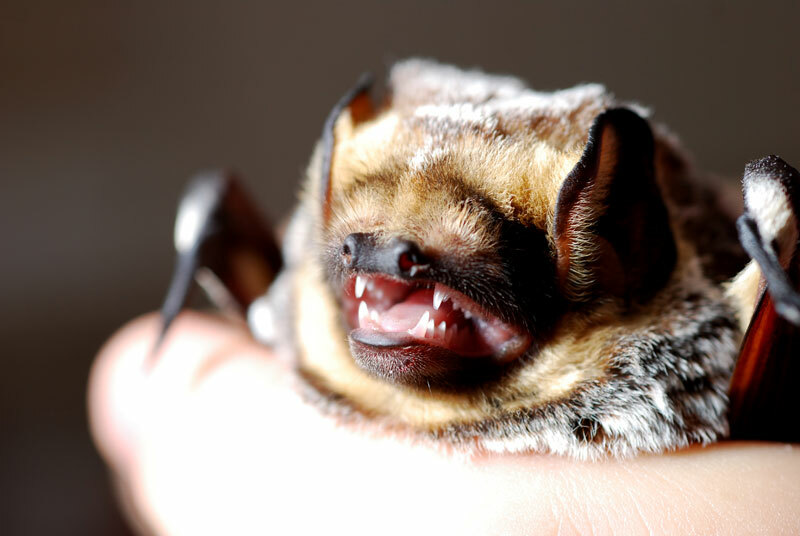 Even though Canadian bats are small and their bites make small wounds, they can spread rabies. People working with bats typically have pre-exposure vaccinations for rabies to protect them from this disease. Bats differ from all other mammals in their ability to fly. Their wings are folds of skin stretched between elongated finger bones, the sides of the body, the hind limbs, and, in Canadian species, the tail. 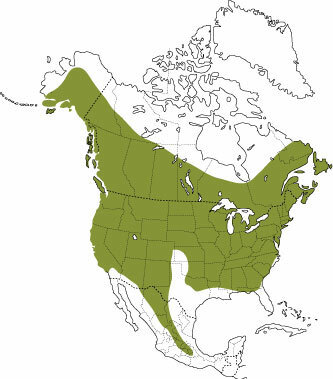 The map shows the distribution in North America of the little brown bat, one of the most common bats in Canada. The summer distribution of the red, hoary, and silver-haired bats is generally similar but probably not as extensive. We must remember, though, that red bats have been found as far north as Southampton Island in the Arctic, and hoary bats also occur in Hawaii and in the Galapagos Islands in Ecuador. Although some bats in the tropics feed on fish, fruit, nectar, or even blood, bats of Canada feed on insects, usually caught in flight. 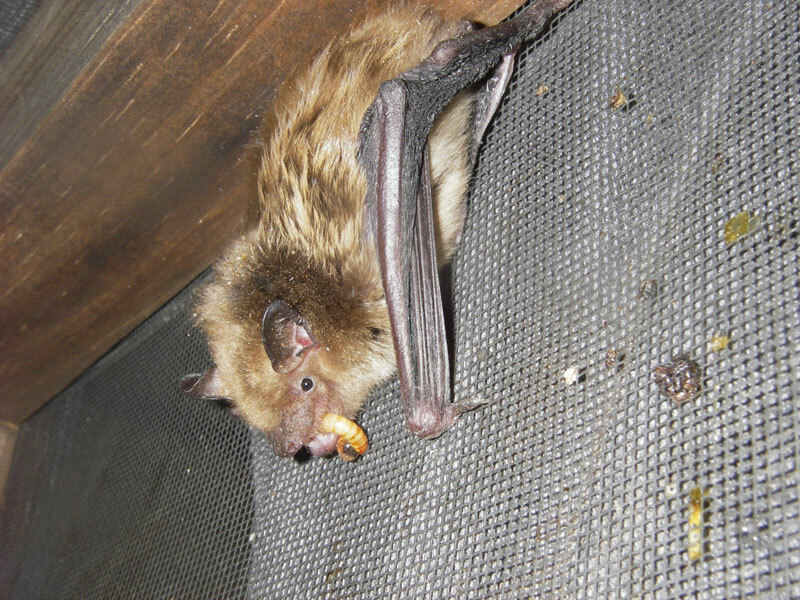 Bats eat a variety of insects, including moths, beetles, mayflies, caddis flies, and midges. Insectivorous, or insect-eating, species of bats typically consume 50 to over 100 percent of their body weight in insects each night in summer. This is the same as a 60-kg person eating 30 to 60 kg of food in one day. Although one scientist found 145 mosquitoes in the stomach of one little brown bat, Canadian bats probably eat relatively few mosquitoes, preferring larger insects with more calories. Birds that pursue flying insects often catch their prey in their mouths, but most insectivorous bats scoop up their victims in wing or tail membranes before transferring them to the mouth. Little brown bats can chew their food very rapidly and in the laboratory have been observed catching fruit flies at a rate of 10 per minute. Early in August, adult males make nightly visits to the caves and mines that will serve as hibernation sites. They arrive at these locations after feeding and spend several hours underground. As August progresses, more and more adult females and young join the males at hibernation sites, and by the middle of August the first matings take place. Most of the mating occurs before the population of hibernating bats builds up in September. The females store sperm in the uterus over the winter; ovulation and fertilization occur when the females leave hibernation in the spring. 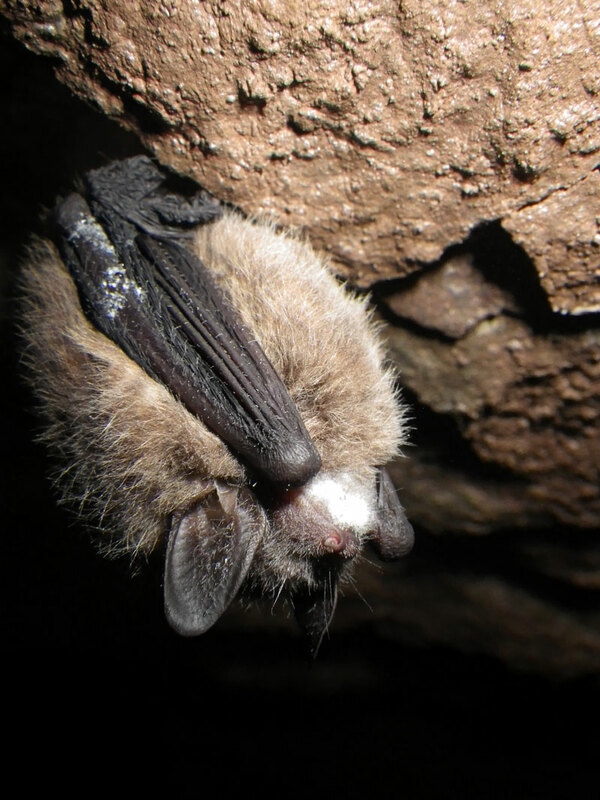 Pregnant females of most Canadian bat species (e.g., little brown bats or big brown bats) gather in the warmest available roosts located in buildings or hollow trees in April or May. Several hundred little brown bats may inhabit one colony. These nursery roosts are the sites where young are born 50 or 60 days after fertilization, in the middle of June, and the young are raised there. Each female little brown bat gives birth to a single baby. Females leave their babies in the roost each night when they go out to forage. On their returns, mothers unerringly select their own baby from the many others waiting in the nursery. Baby little brown bats grow rapidly, increasing their wing area by 10 times in three weeks and starting to fly by the age of 18 days. At this stage, they have shed their milk teeth and begun to eat insects as well as their mothers’ milk. The months of July and August are spent in heavy feeding as the females and young build up their fat reserves for hibernation. We know relatively little about the lives of adult males in summer. They do not live in the nursery colonies with females and babies, and we presume they roost alone or in small groups in cracks and crevices. A lack of information about the sizes of most bat populations in Canada makes it difficult for biologists to accurately assess their conservation status. 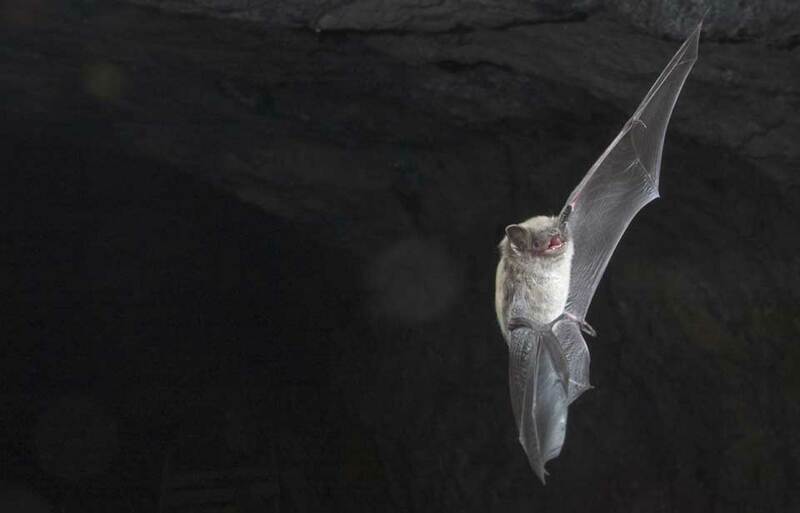 Historical records, for the numbers of bats hibernating in some caves and mines, for example, suggest declines in populations, but the accuracy of these data is open to question. While many animals (including martens, skunks, raccoons, some snakes, domestic cats, and some owls and raptors) are opportunistic predators of bats, there are no records of any predators specializing in bats. Bats appear to be most vulnerable to predators when large numbers are in a roost, arriving at or departing from it. Disturbance by people is probably one of the main threats to the survival of bats. Disturbances in nursery colonies often result in abandoned young which do not survive the experience. Disturbance during hibernation rouses bats, which in turn forces them to burn energy they otherwise would use in hibernation. One disturbance of this sort costs a little brown bat the energy that would sustain it over 60 days of hibernation. Effective conservation means protecting bat roosts from people. The Committee on the Status of Endangered Wildlife in Canada (COSEWIC) has determined that for some species in Canada—the fringed bat Myotis thysanodes and the Keen’s long-eared bat Myotis keenii—we lack enough information to make informed judgements about their conservation status; they are designated "data deficient." 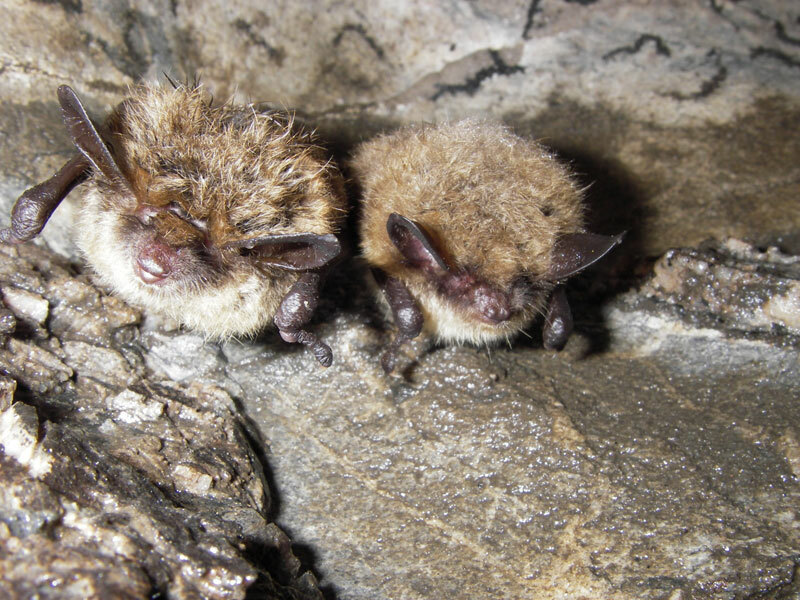 Two other species, the pallid bat and the spotted bat, are considered at risk because of their small populations in Canada that are limited to relatively small areas in southern British Columbia. Pallid bats have been assessed as threatened by COSEWIC and are listed under the Species at Risk Act. This means that it is believed that they are likely to become endangered if nothing is done to reverse the factors leading to their disappearance from Canada. Pallid bats take much of their prey from the ground. They occur only in the very southern Okanagan Valley, where they roost in cliff faces and rock crevices. Spotted bats are more widespread than pallid bats, but they were only noticed in Canada in 1979. 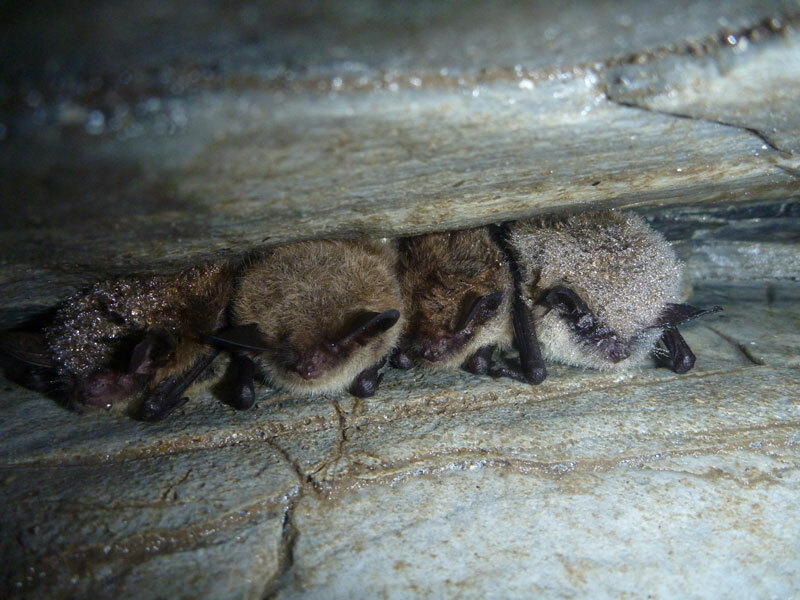 These bats are considered a species of special concern by COSEWIC, and they are under consideration for listing under the Species at Risk Act. (A species of special concern is one that may become threatened or endangered because of a combination of biological characteristics and identified threats.) Like pallid bats, spotted bats roost in cliff faces but hunt flying insects, usually in Ponderosa Pine woodlands. They are conspicuous because their echolocation calls are readily audible to people. Survey data suggest that there are not many more than 100 adult spotted bats in Canada. Pallid bats and spotted bats may migrate to the United States for the winter. Alringham, J. D. 1996. Bats: biology and behaviour. Oxford University Press, Oxford. Fenton, M. B. 2001. Bats, revised edition. Facts On File Inc., New York. Kunz, T. H., and M. B. Fenton (editors). 2003. Bat ecology. University of Chicago Press, Chicago. Nagorsen, D. W., and R. M. Brigham. 1993. The bats of British Columbia. University of British Columbia Press, Vancouver. Neuweiler, G. 2000. Biology of bats. Oxford University Press, Oxford. van Zyll de Jong, S. 1985. Handbook of Canadian mammals 2: Bats. National Museum of Natural Sciences, Ottawa. Wilson, D.E. 1996. Bats in question: the Smithsonian Answer Book. Smithsonian Institution, Washington, D.C.
© Her Majesty the Queen in Right of Canada, represented by the Minister of the Environment, 1987, 2005. Reprinted 1990. All rights reserved.